I’m joining in with the Quaker A-Z blog event – where all sorts of Quakers from all walks of life are coming together to share ideas. Linked only by our Quakerism and the format of publishing blog posts A-Z. In 2013 Rhiannon Grant, Stephanie Grant and Gil Skidmore wrote a blog post each week on Quaker-related subjects in alphabetical order, two posts for each letter. I enjoyed these so was pleased to be invited to join in this year. I’m inspired by a previous project I’ve done, which was in turn inspired by “The Encyclopedia of an Ordinary Life“, so am viewing this as an “Encyclopedia of a Wardening Life”. In other words – I’m viewing this as a bit of a hodgepodge of ideas and views – some serious and others… well as a bit of fun. To browse through all of the posts click on the Quaker A-Z link is the side bar or here in this post. 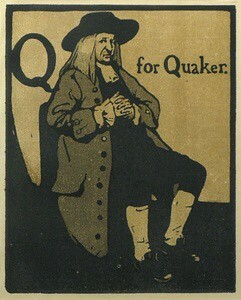 This entry was posted in Blog, Quaker A-Z, Quakers by Wendrie Heywood. Bookmark the permalink.